Will contests can be drawn-out, ugly battles among loved ones that do long-term harm to family unity. As you’re creating your estate plan, you’ll likely want to minimize aspects of your will that could cause conflict between family members, or at least prepare your heirs in advance for what they can expect to see in your will, possibly defusing future conflict. Read on to learn about common reasons for contesting a will, and contact a seasoned estate planning lawyer with additional questions. Trustees are tasked with managing the assets in the trust in a way that best carries out the wishes of the grantor and leads to stable growth of the assets in the trust. Making investment and money management choices that carry out these ends can be a challenge for a single trustee; they can become even more challenging when two trustees must agree on all these decisions together. You may be reluctant to choose one friend or child over another as your trustee, but asking two people to serve together can lead to discord and even legal challenges between trustees. Instead, consider choosing just one trustee and naming your second would-be trustee as a successor. Explain the reason for your decision to the successor to dispel any hurt feelings. One of the likeliest candidates to challenge a will is someone who desperately needs financial support and who might’ve expected more than they got (or that their better-off sibling got) from your will. You might head-off a potential challenge by leaving the needier heir a slightly larger gift than other heirs in a similar position. Alternately, if you have multiple large assets to be allocated among your heirs, such as a home or valuable art object, you could leave the more substantial or practical asset to the heir-in-need. It is when someone close to the testator, such as a child or sibling, is left out of a will that a legal challenge becomes highly likely to occur. Someone who has reason to expect that they would inherit a gift but does not may try to argue that another relative manipulated or threatened a vulnerable testator in order to get the disinherited person cut out of the will. If you’ve decided that you don’t wish to include a relative in your will and fear their reaction, consider writing a letter to the disinherited person at the time that you draft the will so that they cannot argue that they would have been included had it not been for another heir’s undue influence. You could also acknowledge in the will itself that a likely heir was not included, as well as the reasons for that fact. 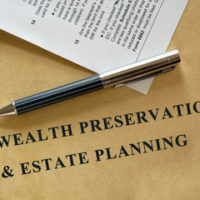 For seasoned, effective, and professional legal help creating an estate plan in Illinois, contact the Chicago wills & trusts lawyers at Johnson, Westra, Broecker, Whittaker and Newitt at 630-665-9600.